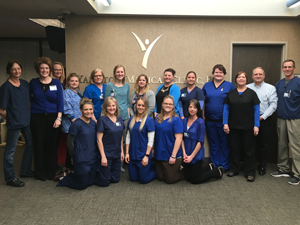 Colorectal cancer (often referred to as colon cancer) is the third most common cancer in the United States and the second leading cause of death from cancers that affect both men and women. Colorectal cancer affects all racial and ethnic groups and is most common in people ages 50 and older. The best way to prevent colorectal cancer is to get screened starting at age 50 and every 10 years thereafter. There are often no signs or symptoms of colorectal cancer – that's why it's so important to get screened. 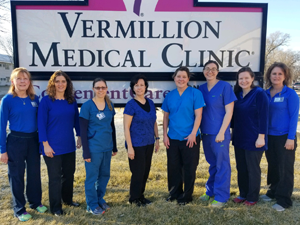 To increase awareness about the importance of colorectal cancer screening, physicians and employees at Yankton Medical Clinic, P.C wore blue to raise awareness. 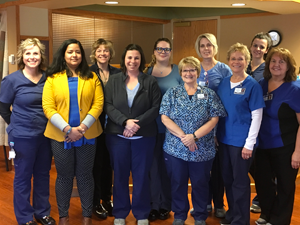 According to the South Dakota Council on Colorectal Cancer, an average of 425 new cases of colorectal cancer are diagnosed per year in the state. When it comes to screenings there are a variety of tests available. 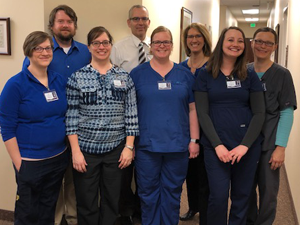 Sara Crisman RN, works with Medicare-eligible patients on a variety of health issues stresses, "While there are multiple options in screening for colorectal cancer, colonoscopies remain the most reliable method for detecting cancer early".